spent some time in the Absent Teacher Reserve before being hired by a new school for this fall. The New York City Department of Education and the United Federation of Teachers are, together, accountable for the "Absent Teacher Reserve" or "ATR" disaster. Excessing teachers is not new. Closing schools is not new. What was new, when Mike Bloomberg came into his position as Mayor of New York City, was the streamlining of the trashing process for tenured teachers. It was the idea that teachers were protected by tenure rights that someone up the line in the food chain disliked. Bloomberg spoke often about Jack Welsh and the firing of 10% of the workforce to keep employees on the ball, always worried about "being next". The City was, in 2003, under the spell of management/administrators of public agencies to get rid of the riff raff, the employees who sit around and do nothing all day. Bloomberg was led to believe (I honestly do not think he checked this out himself) that tenure gave tenured employees the right to do nothing because they could never be terminated. This is, was, and will be, fake news. But fake news and false claims work. Especially if someone knows how to use the dark web, how to hack into computers, or who has malicious intent to make up lies about someone. Most people still believe what they read and see on the internet. So what happened in 2003, and I was fortunate enough to be there to see it, was a full scale attack on tenured teachers and "failing" public schools, so that massive numbers were thrown into big warehouses around NYC (in 2008 there were 8 main warehouses). Some remained for 1 year, others 7-15 years, and a few are still sitting in rooms where they are not given any work, not called a rubber room, but still the same thing. A reassignment room where you are told to sit until further notice is a rubber room. I started visiting rubber rooms in 2003-2004 when my friends David Pakter and Polo Colon asked me to visit them at 25 Chapel Street, 10th floor. I was there several times a week, and stayed all day, chatting with the teachers there about their stories, their schools, and their administrators. The UFT went to the rubber rooms I think 1 time/year, but everyone at the UFT knew that I was talking with the members, because I also attended 3020-a hearings at the request of members, and then the charged employees started asking for me to help their NYSUT attorney settle their cases. So, I did that. Then I was hired to work as a Special Representative and given an office at 52 Broadway, 16th floor in 2007. I was in all the rubber rooms every week (except Staten Island) until August 2010, when I left to start advocating for teachers' rights at 3020-a on my own. I still remember when suddenly, in 2012, I heard that every charged UFT member who was not terminated at 3020-a would become an ATR. I asked where this was written down, and heard it was not in writing, it was "just the way it is." Suddenly, teachers who had been charged with something but who was not terminated, even if completely false, who had inefficient counsel at the 3020-a and/or a biased arbitrator, became a substitute teacher/nomad, wandering week to week to a new school, replacing full-time teachers/guidance counselors for a day/week/month. How do you establish enough trust with a child to counsel him/her, if you meet them for a day or stay with them a week, then disappear? How can you teach? Also, ATRs who are assigned somewhere temporarily, mostly a few days or weeks, often do not have access to IEPs, and don't input grades. Students are smart enough to know that if you are not grading him/her, why bother doing the work? This is really a black/white picture of ATRs and their bizarre situation in a school, and there are many layers of grey which I am not going into here. But the plan to remove tenure by displacing thousands of people and making it torture to remain in the DOE, certainly worked to create an environment of fear, resentment and even hatred. It seems to me that we are seeing a return to rational strategic planning, with the new contract implying that ATRs can be placed in their content area in September. But "CAN" does not mean "WILL". Let's see. Unfortunately, the UFT is still interested in playing-along-to-get-along with the Chancellor, Mayor, and everyone underneath. This is not going to change anytime soon, unless someone wins the $billion lottery and pays everyone to take a looooong holiday. It is all about money, after all. She was previously a teacher at the Foreign Language Academy of Global Studies (FLAGS), which closed at the end of the 2015-2016 school year. 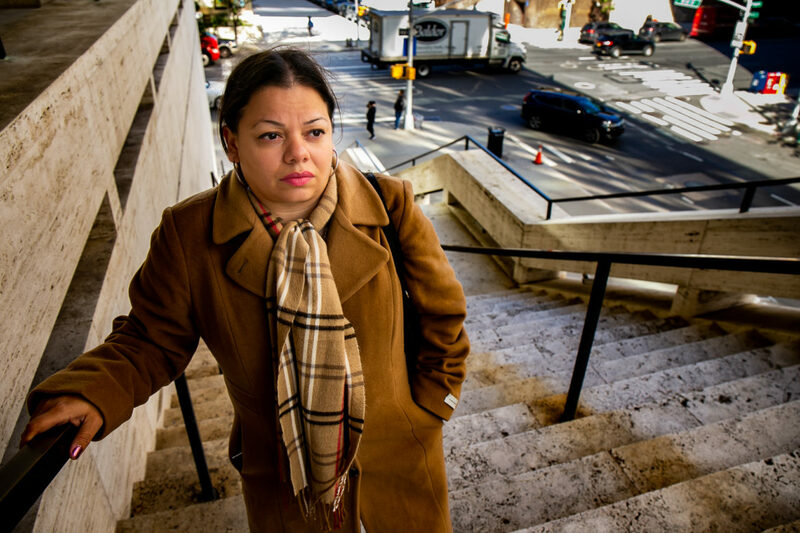 Like many teachers after a closure, Rodriguez was placed in the ATR, a pool of DOE educators who lack permanent placements in city schools but remain full-time DOE employees. Rodriguez said many teachers in the pool have a similar story to hers, finding themselves relegated to the list in the aftermath of school’s closure or a program cut. After FLAGS’ closure, Rodriguez was hired on a provisional basis to fill in for a year for a teacher on sabbatical, but come the end of the school year she was back seeking a full-time role. Rodriguez, like many others, found herself in a proverbial limbo while in the pool; educators in the ATR are still full-time DOE educators (and are paid as such), but often fill in short-term gaps, covering for teachers during parental leave or medical absences, working as substitute teachers or performing administrative work. However, critics contend that many of these excessed teachers are saddled with disciplinary issues or are not seeking new full-time teaching positions, content to take the short-term work. How did the ATR start? The ATR is a result of 2005 negotiations between the United Federation of Teachers and the Bloomberg administration, who wanted to give school principals greater autonomy in hiring decisions. Prior to these negotiations, senior teachers had a greater say in choosing schools in which they were placed, according to Jeff Kaufman, a computer science teacher at Far Rockaway High School and former member of the UFT’s Executive Board. He described this loss of seniority as a “giveback” by the UFT. “Principals now control, to a large degree, who is in their school,” he says. Instead of automatically placing excessed teachers in new schools, the ATR carved out a way for principals to make their own hiring decisions, while excessed teachers were ensured they’d remain on the DOE payroll while seeking a position. Many initially applauded the move as an overdue correction to tenured teachers’ control in their own placement (arguing this often led to experienced educators disproportionately getting jobs in certain schools and districts). Now, most agree that the ATR has led to more problematic consequences, and many teachers in the pool assert many of these consequences were in fact the intention all along. Two years after the establishment of the ATR pool, the city implemented the Fair Student Funding formula, which recalibrated the way in which the DOE determines how much funding schools receive.The city intended to direct more funding towards schools that had been shortchanged over the decades, but teachers’ salaries were to come primarily from this revised funding on the principal’s discretion (as opposed to the DOE directly paying teachers’ salaries). Critics argue this incentivizes principals to not hire experienced (and higher-salaried) teachers, leading to an ATR pool that is exceedingly older and growing more expensive by the year; ATR payments cost the city $136 million last year. Rodriguez argues this disincentive and a generalized stigma against ATR teachers is depriving the city of a supply of time-tested educators who could be used in the classroom on a more permanent basis; what’s more, the city is already paying for them. The ATR’s cost continues to grow as the pool grows older and more experienced, according to a recent report from the Citizens Budget Commission. Employees in the ATR pool have been teachers for 18 years on average, compared to the average 10.2 years of the total DOE teacher workforce, and the average ATR salary is $98,126, compared to $84,108 for all teachers. In 2017, a quarter of teachers on the ATR were also on there five years earlier. Some argue that this indicates teachers are not being hired for full-time positions or are not looking for work, though it is also possible a teacher could have been hired off the pool and subsequently excessed again. There were 788 teachers in the pool in 2006, during the first year of implementation, but after a spate of school closures during the Bloomberg administration that number grew exponentially; at the start of the 2014 school year, there were 1,676 teachers in the pool. That number dropped to 1,202 at the start of 2018, but the Panel of Education Policy closed 10 schools at the end of last year. Additionally, while as many as a third of educators on the ATR have faced a disciplinary issue, what that designation entails remains opaque. According to the UFT, tenured teachers in the ATR are allowed a hearing before an independent arbitrator when accused by a principal of misbehavior. However, a teacher may end up in the ATR pool regardless of the outcome of any disciplinary process, according to Kaufman. A tenured teacher may be the recipient of 3020-a charges (which challenge the protections a tenured teacher has and can be a first step towards dismissal). Those charges could be sustained (potentially resulting in termination), but they can also be mediated through arbitration or could even be dismissed altogether. However, even in the cases of dismissal, if a principal opposes reinstating a teacher in the original school that teacher could be excessed and placed in the ATR pool. A teacher would have to ‘grieve’ their status in the ATR to be reinstated over the wishes of the principal in the original school, and Kaufman said he had never seen a successful grievance in such instances. Ana Champeny, the Director of City Studies for the Citizens Budget Commission and the author of the report on the ATR, noted that the pool’s structure, coupled with New York State’s protracted disciplinary process, could lead principals to see the ATR as an alternative method for dealing with unwanted teachers. Still, most ATR teachers are not in the pool because of a disciplinary matter, and some teachers in the pool believe principals shy away from hiring ATR teachers because of the cost involved. Principals may also want to hire inexperienced teachers whom they may feel will be more amenable to that principal’s particular vision, according to James Eterno, a DOE educator who entered the classroom in 1986 and retired last year. After Jamaica High School closed in 2014, he found himself excessed into the ATR pool, and strongly disagrees with how ATR teachers are treated by the DOE and by the principals weighing whether or not they should be hired. Camille Eterno, a high school teacher and James’ wife, is currently in the ATR pool, and said that principals indeed considered ATR teachers differently than other prospective hires. James Eterno agreed, saying principals often will not even consider ATR educators with years (or decades) of experience because of the higher salaries. However, some criticize the teachers in the pool, bemoaning the fact that they have full-time salaries without permanent classroom placement. Dan Weisberg, the executive director of The New Teacher Project, said he would question placing ATR educators in classrooms, arguing that too many had significant past disciplinary issues. He also disputed the idea that principals avoid hiring experienced ATR teachers. TheFair Student Funding (FSF) formula of 2007 does mean that principals are weighing the value of an educator against the cost that hire entails, rather than making hires on their own with the DOE footing whatever the teacher’s price tag may be. Prior to the FSF, a given school’s funding largely correlated with teachers’ salaries; this meant there was often disparate per-student funding from school to school. When teachers had more power over where they were placed (prior to the 2005 agreement), educators with seniority often gravitated towards certain schools, and those schools would subsequently get larger budgets to cover their costs. This shifted with the FSF, which became by a significant margin the largest financial allocation for schools each year. According to an 2013 IBO report, funding from the FSF allocation can comprise as much as 70 percent of a school’s budget and is tabulated based on the characteristics of a school’s student body. For each school, the needs of the students and schools are weighted, including how many students are in each grade and whether some students are English Language Learners or require special-education services. Supporters say the formula aims to instill more equity among schools, cease the funneling of funding towards schools with the greatest number of high-salaried teachers, and direct more towards schools facing the greatest need. However, only 23 percent of schools received the full amount of funding they were allocated under the FSF in 2017, according to Chalkbeat. In the aftermath of the Great Recession, many FSF funding increases were delayed or cancelled, meaning many of those schools that were inadequately funded prior to the FSF are constantly behind the more affluent schools (additionally, the more affluent schools never had their allocations reduced when the formula was put into place). This confluence of policies leads principals, particularly in schools receiving lower funding, to have a far greater incentive to hire younger teachers as opposed to taking on the expense of an experienced educator, according to many ATR teachers, because now the expense is being drained from the principal’s FSF allocation (which may be lower than the formula deems it should be). A starting teacher with a Bachelor’s Degree and no prior teaching experience can expect to make, on average, $56,711, an amount more than $40,000 lower than the average salary of teachers in the ATR pool. New York City has a young teacher workforce compared to the rest of the state; a 2018 Rockefeller Institute report found that 52 percent of city teachers were younger than 40 years old in 2015-2016, and only 27 percent were 49 or older. While this might mean teacher retirementswill pose less danger of school or subject shortages in the city than elsewhere, it leaves NYC’s teacher workforce more susceptible to higher rates of turnover and attrition among younger educators; nationally, less than a third of teachers who leave the profession annually do so because of retirement, according to the Learning Policy Institute. Teachers hired directly out of school are more likely to leave the profession or transfer to a different school, and cash-strapped schools could be placed in a difficult position if principals feel they are only able to afford the expense of inexperienced, younger teachers. While it’s likely that the ATR pool continues to grow more senior because of its rising costs (even as the number of teachers in the pool drops), the DOE does not release regular detailed updates on the state of the pool, or on the age and experience level of the educators remaining on it. Champeny lamented the lack of data, saying it was more difficult to propose substantive solutions to the quandaries created by the pool’s existence. The de Blasio administration says it is taking steps to reduce the pool’s size; last year, former Brooklyn Technical High School Principal Randy Asher was tasked with shrinking the ATR. Since 2014, the city has offered separation incentives to encourage ATR teachers to take a lump sum in lieu of staying on the DOE payroll. In 2014, 115 teachers left, and in 2018, the city offered ATR teachers $50,000 to leave the profession; 170 educators took the deal. The CBC report indicated the move cost the city about $8.5 million, but would save the city about $23 million per year in salary expenses. The DOE also promises to subsidize salaries of ATR teachers for schools who provisionally hire them by 50 percent in the first year and 25 percent in the second year; ATR educators who receive ratings of “highly effective” or “effective” at the end of the first year in the new school will then become permanent hires (though some teachers in the ATR pool say the plan leads some principals to provisionally hire ATR teachers, and then push for a low rating at the end of the first year to get the 50 percent subsidy without having to take on the cost in the following years). The CBC found the subsidy offer led to 372 ATR hires during the 2017 school year. Last autumn, the city also began to place ATR educators in schools without the approval of those school’s principals. Many principals vociferously opposed the practice, calling it “forced placement” and decrying the loss of control in hiring decisions. The city originally wanted to place 400 ATR teachers in school though this approach, though only 72 were eventually placed. Earlier this year, The Education Trust uncovered information on those teachers who were placed in schools through this practice; none of the 41 teachers placed in schools without the approval of principals through Oct. 15, 2017 had an “Unsatisfactory” or “Ineffective” rating, according to the Education Trust. Of the 205 provisional hires in the past year, only five had an “Unsatisfactory” rating. This indicated the city placed high-quality teachers in schools, but the Trust’s report expressed worry that the remaining pool of ATR educators could be disproportionately packed with teachers with “Unsatisfactory” ratings (though The Trust acknowledged that the pool was constantly in flux). In last week’s announcement of a new contract between the city and the UFT, de Blasio acknowledged the new agreement did not do anything in particular for teachers in the pool, but stressed that the administration was tackling the problem through other means. The DOE contends its policy reforms are starting to have an impact, noting that there were 765 teachers in the ATR at the conclusion of the 2017-18 school year, compared to 1,131 at the end of the last school year, along with efforts to emphasize longer-term placements to offer schools and educators more stability. For Rodriguez, an uncertain summer was punctuated with the call she was hoping for; she was off the ATR pool, working as an ESL teacher as a provisional hire at a school in Manhattan. The position has the potential to extend beyond the year. But her thoughts remained with other teachers still in the ATR pool, lacking a permanent placement. Some may enjoy the substitute work, but Rodriguez was adamant that the current design of the system was wasting the talent and experience of teachers already on the payroll. Assessing the ATR’s progress over the past decade, Eterno contended that the pool’s existence amounted to an towering array of missed opportunities.